Decatur Arts Alliance invites artists to submit entries for the juried 2017 Decatur Arts Festival Fine Arts Exhibition of 2- and 3-dimensional works. This exhibition contributes a fresh and unique perspective to the festival. The audience represents a broad spectrum of knowledge and appreciation of the arts with a diversity of styles and media. Artwork will be chosen from submitted entries by a panel of three jurors on the basis of creative excellence and quality of execution. Works selected for the show reflect a wide range of artists’ experiences and viewpoints with excellence as a common thread. The exhibition will be in the Dalton Gallery at Agnes Scott College in Decatur, Georgia. The Dalton Gallery is in the Dana Fine Arts Building. All works must be original and completed within the last two years. The sponsors are the final authority on eligibility. Works to be hung must be ready for hanging with any necessary hardware in place. Artwork must fit through a standard door. Video presentations are eligible, but the gallery does not offer facilities for projection. Any selected videos will be shown on a flat screen or computer monitor. An artist entering an installation piece should be prepared to personally deliver, install, and de-install the work as needed. All physical requirements for installations are considered during the selection process. Purchase awards totaling $2,500 are selected by the City of Decatur, Decatur Business Association, and Decatur Downtown Development Authority for the City of Decatur’s public art collection. Additional purchase awards are being solicited. Sales are encouraged. The Decatur Arts Alliance handles all sales and collects a 25% commission on all artwork sold as a result of the 2017 Decatur Arts Festival Fine Arts Exhibition. All artwork for sale must be priced by the artist and so stated in the entry. Please be sure to include the 25% commission for the Decatur Arts Alliance in your price. 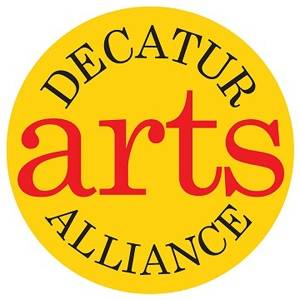 The Decatur Arts Alliance is a nonprofit partnership of artists, business owners, and residents dedicated to supporting and enhancing the arts in the city of Decatur, Georgia. Decatur, Georgia is a small city located five miles from downtown Atlanta. The Decatur Arts Alliance sponsors the annual festivals and special art events for members only. It provides a collaborative environment to coordinate the interests of artists, gallery owners, theater groups, dance groups, and performance venues within Decatur and develop the city as a strong arts community. The Decatur Arts Alliance strives to make art accessible to every member of the Decatur community through art events and public art. For more information, contact info@decaturartsalliance.org.